Privateers! is a modular scenario driven board game of pirate adventures with a good deal of fantasy and otherworldly horror thrown into the mix. Try to imagine Arkham Horror on the high seas with the options to play competitively, cooperatively or as teams. This is Myling Games’ first board game and first Kickstarter. I had the pleasure of interviewing the game’s designer and artist Tina Engström about the game, its development and a certain Disney ride turned film. A storm is brewing and threatening to send your crew overboard when a ship full of bloodthirsty demon pirates are spotted off to starboard and are heading your way. You have until the demonic sea dog scum fire their first canon to tell us about Privateers and why we should back it? - If you don't back it you might miss out on a game you otherwise would love! - Pirates and privateers, ships, treasures and adventure! Need I say much more? - Do you like both pirates and fancy co-op games like Arkham Horror? Then this will be an even more perfect match! - Or maybe you are a fan of the a certain pirate franchise starring Johnny Depp? Also a perfect match! - Myling Games is a small indie company without the economical strength to release the game without some serious funding. Without it, there will be no Privateers! -You help me keep from focusing too much on bad things, by making it possible for me to focus on creating and finishing an awesome game. - And, as with every other Kickstarter project out there. You help someone fulfil a dream! 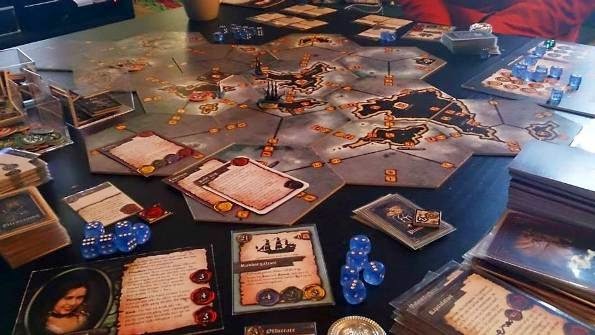 There are a quite a few pirate themed games out there, what sets Privateers apart from the competition? The most obvious one is that there are no other co-op or solo pirate themed games where you actually use a ship, as far as I know. And we have looked, since I love old ships for some reason. They just inspire a sense of wonder and adventure that I can't get enough of. Partly because of that, the ship is probably the second most important part of the game, after the player captains. In fact, it is almost treated as a captain, with three game stats and the possibility to upgrade through the use of asset cards. They can add things like oars, an extra cannon deck, more swivel guns, stronger rigging, bulkheads, armour plating and much more. And when the ship isn't good enough to deal with the enemy any longer, it is always possible to trade up. A real ship of the line or Spanish treasure galleon can be used to beat most opponents. But, back to the question, most of the competition seems to be set in the normal historical Caribbean, while Privateers! is set in a weird version of Earth also used for my roleplaying games. And even though it primarily is an adventure game, Privateers! also has some strategic elements the players need to keep track of to win the game. One of the most important points is that Privateers! is designed for replayability. Players have lots of things to do. You can focus on trade, raiding colonies, finding strange places to explore, hunting easy prey in the form of merchantmen, or just plain warfare. If you combine this with the modular game board and all the options the card gives, no two games are alike. How does the cooperative aspect of the game work? Surely the whole point of being a pirate is that you're out for your own personal gain? This is where the privateers part of the game comes into play. The players are professional pirates in the service of one or many colonial powers. If they work for the same nation, they are allies. If every player is on the same side, then the game is played cooperatively. This is something that the players decide before beginning play. There are a lot of things you can do together in cooperative mode (and when playing together in teams for that matter). The players share the same points track, the Influence track, and lose or win together. They may share assets when standing in the same space. They may also cooperate to take down powerful enemies in battle, raid heavily defended colonies together, help each other resolve events or encounter special sites, and things like that. For team and cooperative play this is almost a must when dealing with the boss markers showing up in the end game. This is due to the fact that their ability to soak damage depends on the number of players. But, personal gain is also part of the equation. Without loot, adventuring or trade (if you don't want to burn and pillage), you cannot get the money needed for upgrades and crew and might end up having trouble helping the others win. Privateers! isn’t just about your traditional tales on the high seas, there are also demons, old gods and the undead. What influenced you to blend these otherworldly entities into with the classic pirate tales? As mentioned, I figured it would be fun to base the game on the world used in my roleplaying games: En Garde! III, Pirater! (Pirates! in English) and the second edition of Skuggornas Mästare (Master of Shadows). I like folklore, horror and the 17th century, and mixing those together for a pirate game just seemed like a perfect fit. Even though historical settings can be very interesting and exciting, you can always make it fantastic with the right supernatural ingredients. Then there is Pirates of the Caribbean, which proved that it can be a very good idea to mix traditional pirate stories with mythology. The setting is a strange mix created to be both absurd and captivating, with a traces of folklore and saga, Lovecraft's creations and X-Files. It is a world where most myths, legends and conspiracies are real. Atlantis once ruled it before civil war destroyed the empire, magic works, where the inhabitants of the faery kingdoms of Avalon sometimes get stuck, and where the pre-historic Lemuria was once completely destroyed by the rulers of our galaxy, the ancient and eternal Anunnaki. It is also a world where Anunnaki's servants watch over and experiment on humans, and where demonic creatures from other worlds try to rule from the shadows. How does Privateers! connect into your roleplaying game worlds? Is it merely a common setting or do characters and events cross over both properties? In addition to it being the same world, with the same history, evil aliens, avatars of the old gods and mythology in general, some characters and events may show up in both types of games. One example is the troll Halfdan, who travels the world in the shape of a cat. He may be acquired as an ally in Privateers! and show up in two scenarios plus one rulebook in the roleplaying games. Trolls are like in old Nordic folklore, in the setting. They look mostly human, might act a bit strange compared to humans, have no real sense of ownership, usually know magic, can handle sunlight just fine and usually live very long lives. They may vary in size a bit more than humans as well, and Halfdan in his troll form is a really strong and rugged eight feet tall human looking man with hair on his ears and a few scars in the face. Other important characters in both properties are the pirate captain Janelle Robert, just about every historic person, a few important magical or technological relics, beasts like the kraken and the lusca, some important avatars and much more. How does developing a board game differ from developing an RPG? It depends on the board game I guess. More abstract games and wargames are probably completely different. Privateers! wasn't that different, however. It is an adventure game where large parts of the game are similar to creating scenarios and encounters in an RPG, and the basic rules are built in much the same way. You choose base mechanics, figure out how you successfully test for different things, make a system for combat tied to the basic rules and finally add mechanics for a few unique situations. The biggest difference is scoring systems. They often don't exist in roleplaying games. So that was something new, and also the thing changed the most during development. Am I right in thinking not only are you the game's developer you are also the artist? Yes, that is correct, together with just about everything else except playtesting. So far at least. It would take over a year or two for me to finish every piece of art by myself, so we need a couple of artists to help me if we fund the game. What came first the mechanics or the artwork? How did doing both aspects affect the games development process? For me it was a mix. When I create something I always envision the final result in my head, no matter if it is for a rules system or a painting. The pieces fit in there like in a puzzle or the threads of a spider's web. Then I jump around in the project trying to create the different pieces so that they are connected to each other in the right way. This includes making game components together with the mechanics tied to them. The drawback is that something I'm working on might look a bit chaotic with unfinished fragments all over the place. On the other hand, things will usually come together quite nicely when finishing the project. And last of all, you’ve taken to the high seas with your crew of privateers and ne’er do wells, what the name of your ship and why? Or not. I don't really know, though. There are many names screaming for my attention. Aeternum as it is engraved on my wedding ring. Or maybe Cat, since I'm a crazy cat lady. Or just The Geek, to pay homage to every nerdy and geeky person out there. Without me being one, and without geeks playing games there would be no Privateers! to fund. I would like to offer an extra special thank you to Tina for taking the time to answer all my questions. I know the process was difficult and she was in a lot of pain due to health issues. Privateers! is looking for your support over on Kickstarter now.